Three of my misfits – Greg, John, and Conrad – all swear by the Gore Wear Windstopper Base Level for riding in spring and autumn. With Windstopper technology on the front, over the shoulders, and on the kidney area, it keeps the rider toasty during blustery rides. It’s also water resistant, highly breathable, and quick to dry. 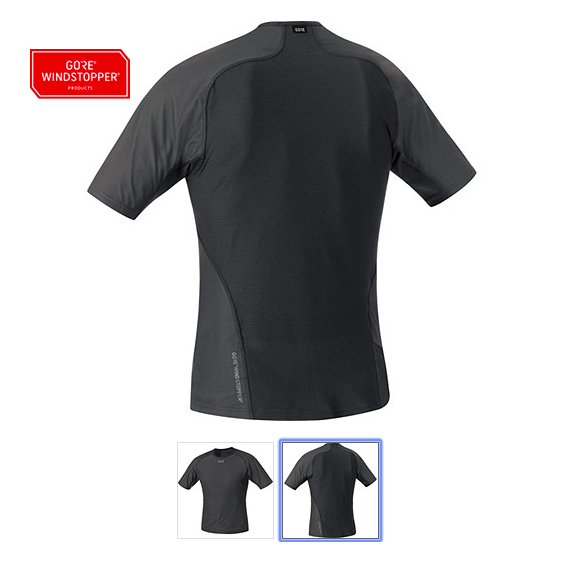 Details: This base layer comes in both men’s (S to XXL) and women’s (XS to XL), black or light gray/white, and costs £49.99/$69.99/€59.95. As mentioned by John, you can also pick up the Gore Base Layer Thermo Turtleneck for the most extreme conditions, (M/W size info as above) for £64.99/$79.99/€69.95. Free delivery, free returns and express delivery if needed. Visit Gore’s website for all the details. 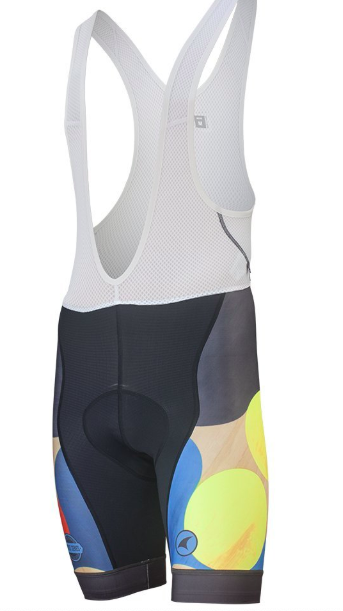 I have been riding in Pactimo bibs almost exclusively since 2014 when I began a local club kit – even to the point of complaint, when one of my mates pointed out that I’d worn them so much they had become see-through on the backside. Of course, it is rather unrealistic to wear Pactimo bibs on every ride I set off on – I do have to wash them at some point – but the Ascent Vector Bibs, which I am now on my third pair of, are definitely at the top of my list when getting dressed for a ride. As someone who has been known to be picky about bibs, the Ascent Vector have consistently given my saddle area no troubles. [You’re painting quite the picture, Luke! – ed] Whether it be a quick 25 miles or a leg-zapping 80, the bibs stay comfortable, breathable, and in place throughout the ride. Searching for a spot of flair? Get fancy and wander into their Artist Series designs. Pactimo has it all for you! ‘Change’ bibs by Ruth Hiller; pactimo.co.uk; £100 / $150. 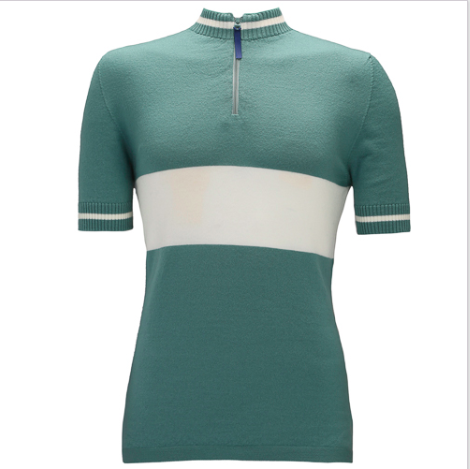 René lightweight jersey; velobici.cc; £175. Int’l shipping avail. Whilst I’ve not tried their stuff, I have heard wonderfully splendid things about Velobici from a little birdie at VeloVoices Towers (hello, Kathi!). The Rene jersey does really appear to have it all. 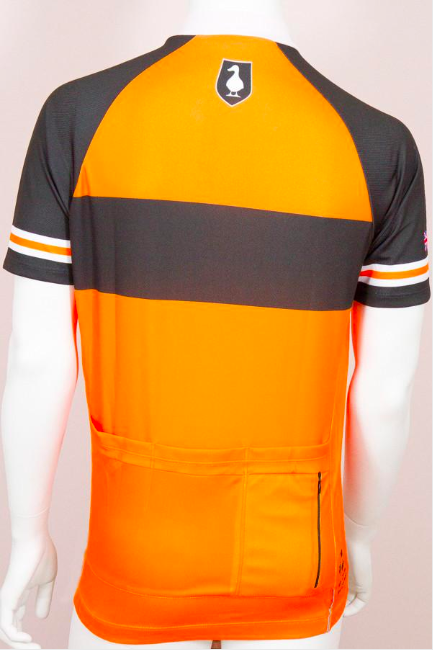 Made from super lightweight honeycomb fabric, this jersey should keep you cool even on the hottest days. It is outfitted with a full-length zipper, four pockets – one of which has a zipper and is waterproof – and UV protection. All of Velobici’s jerseys are made in England and come with a beautiful series of rear pockets that vary in depth. Based on that appeal alone, I am tempted to put them on my Christmas list. Surely, I am not the only one who has worried about their hand pump falling out of their rear pocket. It would appear Velobici has removed that worry with making one of the pockets deeper than the others. DETAILS: The René jersey is available for both men and women. Sizing from XS to XXL; £175. For shipping details, visit Velobici.cc. 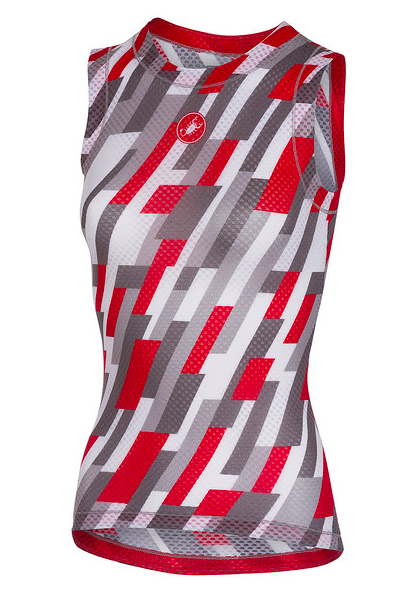 On the other end of our base layer recommendations is the Castelli Pro Mesh Sleeveless. Not only does it tip the scales at a splendidly light 46grams, but it also features “3D mesh fabric for excellent moisture management”. Castelli rate it 4 out of 5 stars for both breathability and lightweightness and for the peacock in you, it comes in an array of flashy colours arranged in geometric patterns that catch the eye. 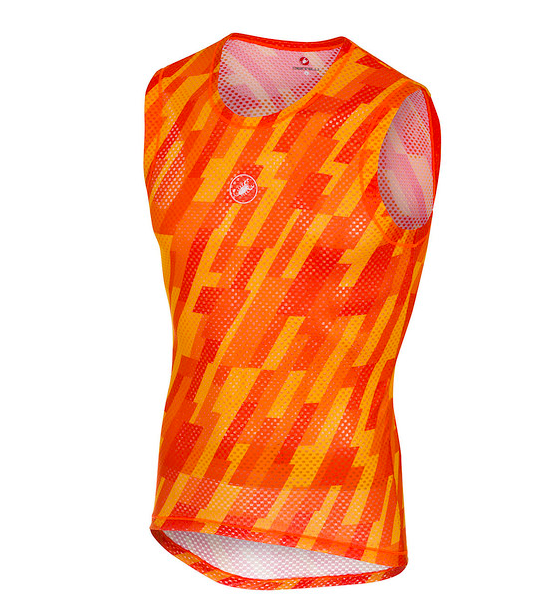 DETAILS: The Pro Mesh Sleeveless, £56/$59.99/€59.95, runs from S to XXL and comes in orange (pictured), grey, pro green and sky blue. A women’s version, £56/$59.99/€59.95, XS to XL, comes in red/white/anthracite (pictured); glacier lake/orange; mint/yellow fluoro. Shipping information is available at Castelli’s website. Do you like to support the environment? If so, then British-based GRN Sportswear is the company for you! With a pledge to use recycled materials, GRN uses fabric (a mix of 80% recycled yarn and 20% Lycra) made from a mix of fishing nets, carpets, fabric, and other waste plastic products to make their clothing. Their jersey designs are just as innovative as their fabrics. 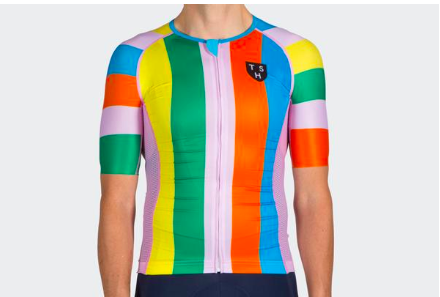 From solid colours to designs that I can only best describe as Merckx-esque, these jerseys are eye popping! In particular, the men’s Duck A L’Orange (pictured) and the women’s Purple Sunshine (pictured) are ones that would catch the eyes of anyone who spots you on the road. 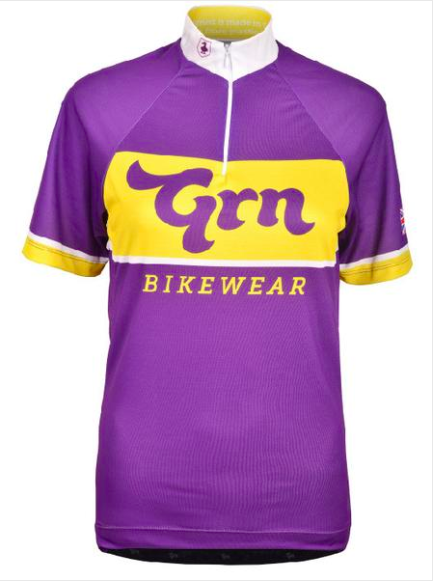 DETAILS: Whereas you may expect a company that uses recycled materials to have a higher price point, GRN sells their jerseys for a reasonable £69. Jerseys are available for both male (S to XXXL) and female riders (UK6-16). A size chart can be found here. Shipping free for UK orders. Note: these jerseys are manufactured to order so it might take more time than usual to fulfil your order. Please see the website for more details. Everyone needs a pair of sunglasses to keep themselves looking stylish on the bike. In an ideal world, they would have interchangeable lenses to accommodate varying conditions or to remove scratched lenses. In an exemplary world, they wouldn’t break your bank account. Well, that is what James has found from Tifosi. The Tifosi Intense Interchangeable Sunglasses come with three different lenses and can be purchased for less than $50! DETAILS: UK shoppers, get the Tifosi Intense Interchangeable Sunglasses from Merlin Cycles’ website. They’re on sale at the time of going to print for £25.50 (from an rrp of £40). For US shoppers, the Tifosi website has the non-interchangeable version, the Tifosi Intense, available for $40. 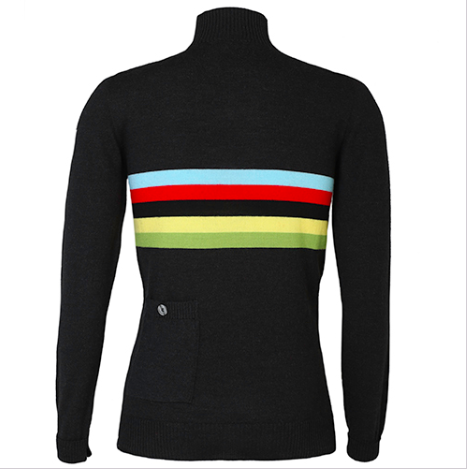 No wardrobe is complete until a merino wool jersey is in the collection. Simply put, they are the most interchangeable pieces of gear that one can own. Riding in the spring, when it’s not warm enough for a summer jersey, but too cold for a winter jersey? A merino wool jersey with arm warmers will keep you toasty. An autumn ride with cool starts to warm finishes? Your merino wool jersey will keep you comfortable throughout. Jura Cycle Clothing offers lightweight, understated merino wool jerseys – both long and short-sleeved versions – that will bring you back to a simpler time. With no visible branding on the front or rear of the jerseys, Jura showcases clean lines and classic designs. One design features the rainbow bands on a charcoal grey jersey, allowing you to resemble a certain Slovakian without being lathered in corporate sponsorship! DETAILS: All jerseys are unisex and available in sizes XS through XXL (size chart). The short sleeve jerseys are priced at £85; long sleeves are £95. For a stocking stuffer, consider Jura’s merino socks for £18. It is only fitting to end a kit gift guide led by a group of Chicago cyclists with a tip of the hat to Tenspeed Hero. This small Chicago-based company never ceases to make a splash in the cycling scene, both with their social media content and clothing designs. Everything looks amazing and you cannot go wrong with anything that you order from them. Their jersey (Men and Women) designs are perhaps the most vibrant and outlandish of this lifetime. Several designs feature blue or blue backgrounds with geometric shapes sprawled all around. Others, such as the Umbrellas of Cherbourg jersey, feature bright colors in horizontal and vertical stripes. Their bibs (Men and Women) are just how you want them – solid dark colors, available in black and blue. DETAILS: Tenspeed Hero also sells socks, caps, and shirts! Jerseys start at £125/$140 and bibs at £188/$200. The caps and socks begin at £18/$24 and £11/$15, respectively. But hey, funding cycling at the grassroots levels costs money! International shipping available – full information can be found on TSH’s website. All prices, information and links are correct at the time of going to press and should be used as a reference only.